The thing is, Yellowstone in winter is also stunningly beautiful. Blanketing snow transforms the landscape from lush summer splendor into a monochromatic scene—at least at first glance. As a good friend and veteran ranger recently told me, “I never realized there were so many shades of white and blue until my winter at Canyon,” a remote location in the interior of the park. Looking south along the shoreline of Yellowstone Lake from the West Thumb geyser basin. Most visitors come to the national park during the summer months. Those who venture to Yellowstone winter are in for an adventure—a very different experience than they would get on a summer trip. Winter conditions last a long time here, far exceeding the three month period from late December until late March that marks the official northern hemisphere winter. It’s possible to see falling snow any month of the year, but starting in October or November, a snowpack develops that will persist until May or June, depending on where you are within the park. For many park visitors, the snows of Yellowstone are the deepest and most profound signs of the season they will ever experience. Yellowstone’s winter visitors come for different reasons. Some are seasoned summer visitors, people who have been to the park many times. They have heard about the importance of winter in determining what living things survive and which ones don’t make it, and are curious to experience this most important of seasons. Other visitors stop by more spontaneously, coming into the park on a day trip to give themselves a break from skiing at Big Sky. 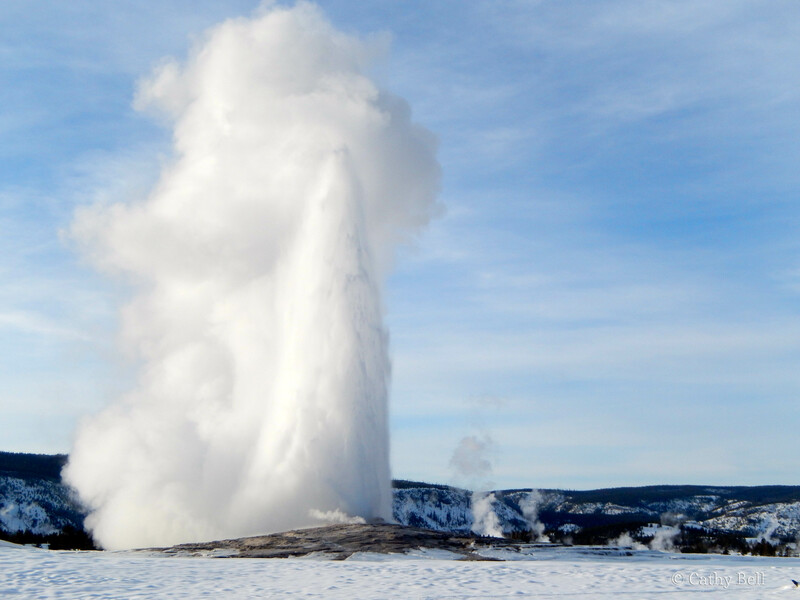 Old Faithful Geyser erupts on a winter afternoon. I was the only person on the boardwalk watching this eruption–something that would never be possible in the summer. Whatever your reasons for coming, a winter trip to Yellowstone is a treat. My favorite means of getting around is cross-country skiing (see earlier post). The Old Faithful area has a great network of ski trails suitable for everyone for beginners to experienced Nordic skiers who want to get out into the backcountry. I had never skied before my first Yellowstone winter, back in 2006-2007, and I have to say I can’t imagine a better place to learn. 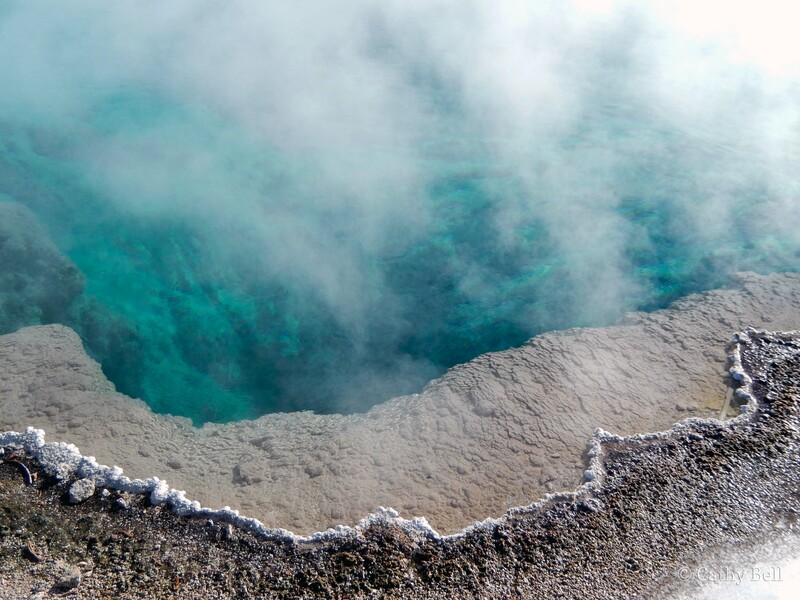 The hot springs are just as glorious in the winter as in the summer, though sometimes steam in cold air obscures the view. It’s possible to travel long distances on foot using skis or snowshoes, but most people travel around the park with the aid of motorized transport. That means riding inside a snowcoach or on a snowmobile as part of a guided group. Both are great ways to experience the park in winter. In-park lodging is available at the Old Faithful Snow Lodge and the Mammoth Hot Springs Hotel. Many visitors stay in gateway communities including Jackson, WY, and West Yellowstone, MT. Have you visited Yellowstone in the winter? Would you like to? I’d love to hear your thoughts in the comments. 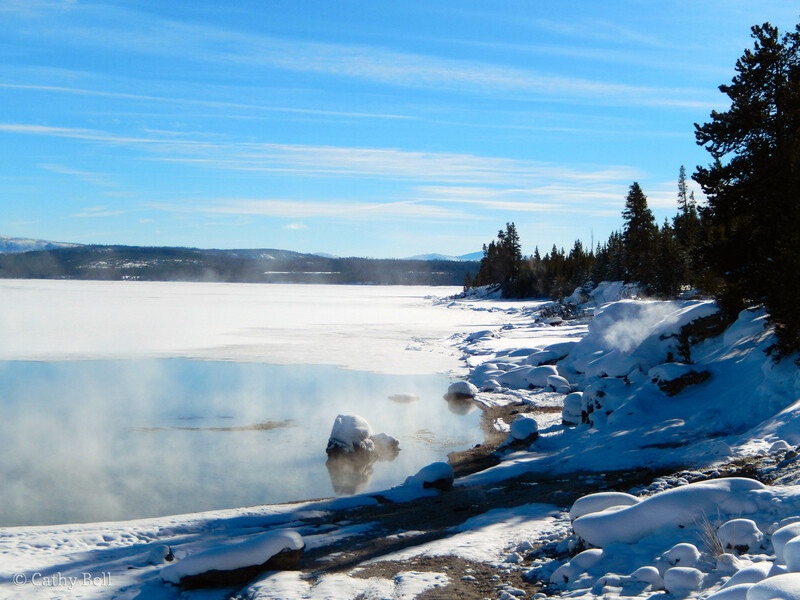 It’s wonderful to experience winter in Yellowstone through your writing and photos, Cathy. Your posts led me to visit Yellowstone’s Facebook page more often, and the photos there are amazing, too. I was hoping to see photos of the kill by the wolves you mentioned though….Unfortunately, I can only spend a significant amount of time traveling in the summer–all the more reason to keep up with what you share here. Hi Angela – Thanks for reading! I too wish I could have shared photos from the wolf kill. Sorry to disappoint. Believe me, if I get any great wildlife shots this winter, I’ll share them here. Yellowstone is a beautiful place to visit. It is a great experience for anyone.